This is an early modern translation of a central text of the Hermetic canon, the Divine Pymander . This Book may justly challenge the first place for antiquity, from all the Books in the World, being written some hundreds of years before Moses his time, as I shall endeavour to make good. The Original (as far as is known to us) is Arabic, and several Translations thereof have been published, as Greek, Latin, French, Dutch, etc., but never English before. It is pity the Learned Translator [Dr. Everard] had not lived, and received himself, the honour, and thanks due to him from the Englishmen for his good will to, and pains for them, in translating a Book of such infinite worth, out of the Original, into their Mother-tongue. Concerning the Author of the Book itself, Four things are considerable, viz., His Name, Learning, Country, and Time. 1. 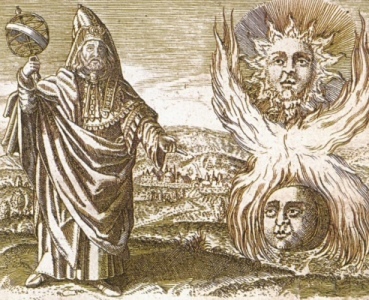 The name by which he was commonly styled, is Hermes Trismegistus, i.e., Mercurius ter Maximus, or, The thrice greatest Intelligencer. And well might he be called Hermes, for he was the first Intelligencer in the World (as we read of) that communicated Knowledge to the sons of Men, by Writing, or Engraving. He was called Ter Maximus, for some Reasons, which I shall afterwards mention. 2. His Learning will appear, as by his Works; so by the right understanding the Reason of his Name. 3. For his Country, he was King of Egypt. First, Because it is received amongst the Ancients, that he was the first that invented the Art of communicating Knowledge to the World, by Writing or Engraving. Now if so, then in all probability he was before Moses; for it is said of Moses that he was from his childhood [Acts vii.22] skilled in all the Egyptian Learning, which could not well have been without the help of Literature, which we never read of any before that invented by Hermes [Chapter x.]. Secondly, he is said by himself, to be the son of Saturn and by others to be the Scribe of Saturn. Now Saturn according to Historians, lived in the time of Sarug, Abraham’s great Grand-Father [Sanchoniathon]. I shall but take in Suidas his judgment, and so rest satisfied, that he did not live only before, but long before Moses; His words are these, Credo Mercurium Trismegistum sapientem Egyptium floruisse ante Pharaonem [Suidas]. In this Book, though so very old, is contained more true knowledge of God and Nature, than in all the Books in the World besides, except only Sacred Writ; And they that shall judiciously read it, and rightly understand it, may well be excused from reading many Books; the Authors of which, pretend so much to the knowledge of the Creator, and Creation. If God ever appeared in any man, he appeared in him, as it appears by this Book. That a man who had not the benefit of his Ancestors’ knowledge, being as I said before, The first inventor of the Art of Communicating Knowledge to Posterity by writing, should be so high a Divine, and so deep a Philosopher, seems to be a thing more of God than of Man; and therefore it was the opinion of some That he came from Heaven, not born upon Earth [Goropius Becanus]. There is contained in this Book, that true Philosophy, without which, it is impossible ever to attain to the height, and exactness of Piety, and Religion. According to this Philosophy, I call him a Philosopher, that shall learn and study the things that are, and how they are ordered, and governed, and by whom, and for what cause, or to what end; and he that doth so, will acknowledge thanks to, and admire the Omnipotent Creator, Preserver, and Director of all these things. And he that shall be thus truly thankful, may truly be called Pious and Religious: and he that is Religious, shall more and more know where and what the Truth is: And learning that, he shall yet be more and more Religious. The glory and splendour of Philosophy, is an endeavoring to understand the chief Good, as the Fountain of all Good: Now how can we come near to, or find out the Fountain, but by making use of the Streams as a conduct to it? The operations of Nature, are Streams running from the Fountain of Good, which is God. I am not of the ignorant, and foolish opinion of those that say, The greatest Philosophers are the greatest Atheists: as if to know the works of God, and to understand his goings forth in the Way of Nature, must necessitate a man to deny God. The [Job] Scripture disapproves of this as a sottish tenet, and experience contradicts it: For behold! Here is the greatest Philosopher, and therefore the greatest Divine. Read understandingly this ensuing Book (and for thy help thou mayest make use of that voluminous Commentary written upon it [Hanbal Offeli Alabar] ) then it will speak more for its Author, than can be spoken by any man, at least by me. Thine in the love of Truth, J.F.